Choosing a maid depend on your choice and Requirement. Different Strategies to choose a maid and our requirement. Factors such as the number of maids you want, whether on a daily basis or weekly basis or long basis etc should be decided before hiring a maid. To decide how many time maids work and what can do maids in your Home. Then select a good maid. change your maid you can just directly contact them over a phone. They also provide bonded maids. Hiring maids through maid service agency is always the safest and the smartest way. 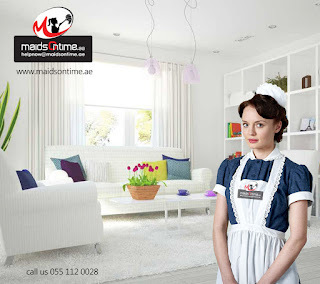 Maids On Time is the maid service agency in Dubai . These agencies are provided professional and trained maids. In today’s world, when people are busy with their life styles and busy schedules, there is no time to do the various household activities.Cooking,Cleaning and take care of the house and the kids become challenging affair. During Such a situations, hiring maid can help you and your house from becoming a mess. You want your house to be cleaned regularly. But apart from your household works, there are many other things in your daily life are important. Hence you get very less time to look after your home. But with a maid you can solve the problem. Maids can do a wide range of cleaning services .Hence you can free your mind of worries and get your home cleaned by a maid. Out of these, always professional maids are the best one to choose for services. These maids can handle and perform numerous jobs properly and accurately. Due to their experience background they do not require any extra training. They have capability to keep your house net and clean but also can take care of your family well in your absence. This gives you a great sense of satisfaction and happy. Most of the maids are trained to get along with your family member.